Bryan McLarty, Operation BBQ Relief’s 2013 Rod Cramer Volunteer of the Year. In this interview, Bryan tells his story of how he and OBR got started. Like several others, I was chatting on a BBQ forum the night the tornado hit in Joplin, MO. It was a devastating F5 tornado that destroyed most of the town. We began listening to the online scanners, and knew it was bad, very bad. Sitting in our homes safe and secure, we felt the need to help like most did, but didn’t know how. One of the guys online said he was going to go set up his BBQ pit the next morning and start cooking food for people, as we knew everything was destroyed. That one idea is what sparked me and so many others to help. Without hesitation I turned to my wife and said, “I’m going to Joplin to feed people.” I had no idea what I was doing at the moment, or what we would be doing, but like a moth to a flame I was being pulled like a magnet and I couldn’t stop it even if I wanted. I truly believe it was the hand of God telling me, this is your time. I was there for 9 of the 11 days, and from that point I knew what my calling was…serving others using the talents he gave me. I have also organized many fundraisers for OBR. We have partnered with the Mercury One Foundation to feed thousands of people, and raise critical funds for Operation BBQ Relief in the process. Besides the awesome power of Mother Nature, I have learned that in less time than a single commercial on TV, someone’s life can be changed forever. We think we are powerful as humans, and then we’re brought back to reality in an instant. I have also seen the true beauty of human compassion. In times of disaster so many people want to help others, and it’s truly humbling. Whether it’s a hot meal, blanket, or just listening to them for a few minutes while they decompress and share their experience. To know the feeling of helping someone who has just lost everything, sometimes including loved ones, is the best feeling a person can have – one that usually leaves you in tears. I say get involved. Please register as a volunteer, and be ready to serve. Here are a couple things that anyone wanting to volunteer should know. First – be prepared to work. It’s the most rewarding beat down you will ever experience, and you will walk away a changed person. Second – Understand that while everyone wants to be a part of helping in a deployment, sometimes you can simply have too many people. Not all volunteers will be called to action at every deployment, but know you were prepared to help nonetheless. There are many ways to volunteer to support OBR without being deployed. Everyone should know that Operation BBQ Relief is 100% volunteer, and as such, we are 100% funded by donations. We have never paid a single penny to anyone, and every dollar of your donation goes directly to helping someone affected by some sort of disaster or tragedy. 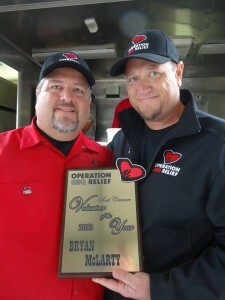 Bryan McLarty embodies everything that Operation BBQ Relief’s Rod Cramer Volunteer of the Year is all about. If you know someone who deserves this recognition, nominate them today. The deadline is April 22nd. NOMINATE HERE.